You guys have read my rants about the loose dogs running about in my neighborhood. Well, our luck ran out. 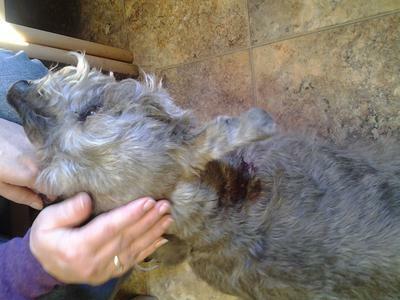 Buddy got attacked by a loose pit bull in our back alley on Wednesday. My wife ran out just as this pit was pinning Buddy on his back and was going for his neck. Luckily, the dog ran off and Sandy was able to help Buddy inside. The attacking pit bull's name is Roxie. She lives across the alley from us. Her and Buddy and Maddie have had yard time many times before. I have pet her and actually interact with her several times a week. The main problem I had was that the owner would just let her run loose. She seemed like a very docile and loving dog. Until Wednesday, that is. Animal control responded in force and we identified the offending canine. The owner admitted to letting her run loose all the time. She does not have current rabies shots. Roxie was impounded and the owner was given many violation citations. She is now in 10-day quarantine to see if she has rabies. Back to Buddy. When Sandy got him back inside, he went straight to my side of the bed and hunkered down on my pillows. A known comfy spot. I was in my basement workshop when Sandy yelled down that Buddy had been attacked by Roxie. I flew upstairs and went to him. He was visibly upset and bleeding badly. I made sure that he was breathing good and was as comfortable as he could be. I then started to assess his injuries. He didn't like that a whole bunch and bit me on the wrist. My wound was minor compared to his. We called the vet and they said to bring him in immediately. We put him in the carrier (which he did not like) for the ride to the vet. The only time he cried was when he put weight on his left front leg. I could see that he was tore up pretty badly on his leg and the back of his neck. A whirlwind of examinations, checks, x-rays and stitches quickly followed. There was some good news at this point...nothing broken, torn, ripped or pierced. He had 18 puncture wounds on his leg and neck, some almost to the bone. It took nearly 40 stitches to close up the major wounds. They wanted to put an e collar on him so he wouldn't lick at the sutures. They couldn't because of the neck wounds. No "cone of shame" for my beefy, big guy. As of today, he is putting some weight on his injured leg and is eating and sleeping well. We know he is hurting because he will let ME pick him up and carry him on and off the front porch. He absolutely doesn't like being picked up. We are giving him his pain meds and antibiotics and letting him rule the roost. Maddie doesn't like all the attention Buddy is getting, but she seems to know that he is hurt and is being very affectionate towards him. 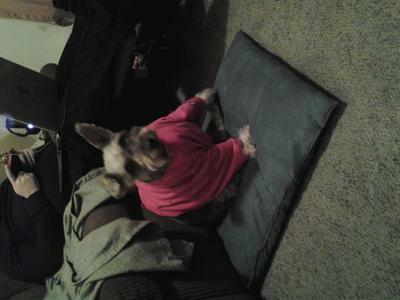 To keep him from licking at his wounds we have put a t-shirt on him. He looks very cute wearing his shirt. I will not rant about the pit bull mystique. They are dogs, just the same as my Schnauzers. I just can't imagine my Schnauzers attacking another dog that they have been around for several years though. 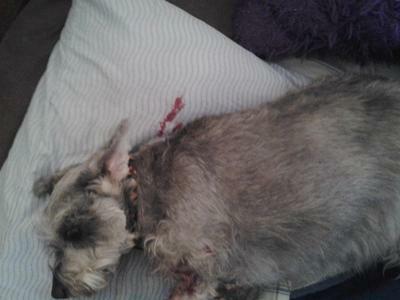 It is the careless and irresponsible actions of the dog owner that directly contributed to this incident. I will be paying him a neighborly visit this afternoon with the hefty vet bill. If he refuses to pay, I will pursue legal remedy through the courts. I have attached some pictures of Buddy before we took him to the vet. They are a bit graphic, so be warned. I have also attached a pic of him wearing his cool little t-shirt. Real men wear pink. It's very good news about Buddy. Buddy got his stitches out yesterday. The vet, as well as us, are amazed at his remarkable recovery. He is showing no signs of limping, just a little tenderness. The vet gave him a clear bill of health and me another bill. I passed the bill to my neighbor. He is kind of balking, so it seems that off to court I go. One way or another, he will pay me. I want to be nice, but I am being stern about this. Stick to your guns and make him pay, he is responsible for his dog's actions. Glad to hear Buddy is recovering well. Well, he's getting there. He is putting weight on his injured leg. He is getting his personality back in full swing too. We still have him in a T-shirt so he won't lick the stitches. We have to go back here in a week to get th esutures removed. Another vet bill for the neighbor to savor. When I presented him with the emergency vet bill, his jaw dropped. He again stated that it was totally his fault. He also told me he didn't have any money either. He must have had some money, because he had Roxie back on the Friday after the Wednesday attack. I didn't let him say what he was going to try and do, I was very firm when I told him that he WILL pay these vet bills or I will sue him. I am going to give him the neighborly benefit and give him until June 1 to make good, or make solid arrangements. After that time, I will be persuing legal action. I didn't have the spare money to fix Buddy up either, but I had to. As he has to make this matter right. It is upsetting -for all of us. Brilliant news that he will make a full recovery. It makes you think about moving house, doesn't it. We are lucky that the pit ran off when Sandy ran out there. It was starting to go for his throat. Buddy is lucky that he didn't have any broken or crushed bones in his leg. He's kind of gimpy, but motorvating better every day. He will make a full recovery we have been assured. Just with a little more "character". Sorry to hear about Max. It truly is upsetting when something like this happens. Sandy and I were total basket cases when we were at the vet. so sorry to hear of Buddy's attack. I too blame the owner, not the dog. I didn't put this on the website as it is upsetting, but Christmas 2013, Max was trotting along a playing field with my Dad when he was attacked by five Labradors - normally docile animals, but any dog can behave differently in a pack. They got hold of him and 'ragged' him like a rabbit. He was rushed to the vet on a Sunday with a ripped throat and big hole - even bigger than Buddy's - on the back of his neck. At the time the vet said Max was very lucky to be alive, a fraction to the side on his throat and his jugular would have been torn open. After 2 months and bathing, tablets, etc several times a day by us, Max made a 100% full recovery. I wish the same for Buddy. Even though they appear softies, Schnauzers are pretty resilient underneath. And people should keep their dogs under control -it is getting worse here in the UK. Compulsory micro-chipping is being introduced soon, it is to be hoped that improved the situation.